Emily Thornberry just promised Labour will lead the fight against fascism. Let’s hold her to her word. 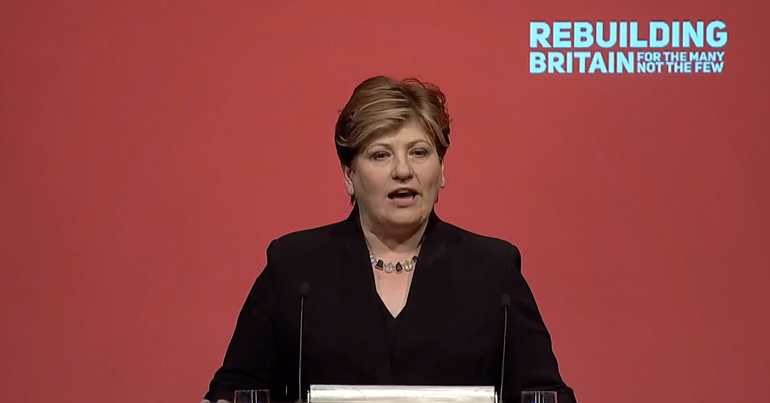 On 25 September, cheers and standing ovations greeted shadow foreign secretary Emily Thornberry during her address to the Labour Party conference. And this was in large part because she spoke about the Labour movement’s historic victories against fascism, while promising to continue that fight. That’s a strong record to have. And Jeremy Corbyn’s election as leader of the Labour Party in 2015 has strengthened anti-fascist and anti-war movements even more. But we must hold Thornberry and Corbyn to their words – and make sure they do what they say they will. Because Labour’s past and current records are not good enough. Emily Thornberry is now LIVE at Annual Conference, talking abut security at home and abroad. Join the conversation ? we must… lead the fight against the forces of fascism, of racism, of prejudice, and antisemitism. She also promised to “lead the world in promoting human rights, in reforming the arms trade, in pursuing an end to conflict”, and committed to a nuclear-free world. Thornberry’s speech was promising, passionate, and convincing. But there are things that Labour can and must do to further strengthen its commitment to international peace. Labour has been too quiet, for example, about what is happening in Rojava in northern Syria – where revolutionary Kurdish-led communities have long been on the frontlines in the ground battle against Daesh (Isis/Isil). According to author David Graeber, “some of the similarities” between the Spanish Civil War and Rojava “are so striking, and so distressing… we cannot let it end the same way”. Some Labour politicians have spoken out about Rojava, but the party can and must do so much more. Thornberry herself, meanwhile, has faced allegations of being weak on Israel’s oppression and occupation of Palestine. She has opposed the Boycott, Divestment, Sanctions (BDS) movement, for example, reportedly describing it as “bigotry against the Israeli nation [that] has never been justified”. The shadow foreign secretary’s description of Robert Kennedy as a ‘man of peace’ is also troubling. Because Kennedy reportedly contributed to the evolution of US counterinsurgency doctrine, which paved the way for brutal methods of warfare in Vietnam and across Latin America. If Labour is to adopt a more ethical foreign policy and truly lead the fight against fascism, it must learn from its past failings too. Shortly after Labour’s election victory in 1997, foreign secretary Robin Cook announced a foreign policy with an “ethical dimension”. And although the policy hardly differed from that of previous governments, the media celebrated the Labour government’s “ethical foreign policy”. Three years later, there were reports that Labour was dropping its “ethical dimension” policy, which had become a stick with which to beat the government. The Labour government was thus implicitly pursuing an ‘unethical’ foreign policy. As well as invading Iraq and Afghanistan, the party ended up arming, training, and supporting repressive states worldwide. In 2017, Thornberry once again pledged to adopt Cook’s “ethical dimension” policy. And now, as Thornberry makes a new rallying call, we must ensure we hold her to her word. We must make sure that, this time, the pledge is serious. – See our previous articles about Rojava to find out more about what’s going on there. And write to your local MP to encourage them to support the region’s fight against fascism. – Read more of our coverage of Labour’s 2018 conference.